RT is joined by Andrey Klimov, Russian senator, and member of the foreign affairs committee, who explains the ongoing crisis in Ukraine, specifically what is happening in the Crimea region, and asserts that the West has intervened to destabilize the whole of Ukraine and now that Russia has stepped in, is pinning the blame for the whole affair on Russia. His words and assertions have the ring of truth when we look at what happened in Egypt where Barack Obama sided with the Muslim Brotherhood to overthrow and destabilize the country, only to see the Muslim Brotherhood removed later. Also in Syria, the US under Obama’s direction, supported, financially and with weapons, the al-Qaeda linked Syrian rebels in a failed attempt to replace Syrian president Bashar Assad. When we step back and look at it all together, it lends credence to Senator Klimov’s accusations. This time the US might have bitten off more than it can chew because Vladimir Putin is not the type to sit back and allow this type of interference from the US in his own backyard. Video details will be shown below the video. Ukraine is on a brink of humanitarian catastrophe. 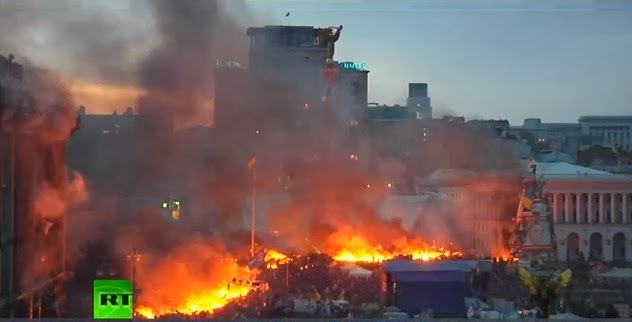 Ultranationalists are in the lead in Kiev after a coup d’etat saw the overthrow of the President. Crimea along with half of the country refuses to accept the new authorities. And now, Russian senators decided to give the President the right to move troops in the region to protect the Russian speakers threatened by the rise of Nazis. What will tomorrow hold for Ukraine? What role will Russia play in the drama? Will it be necessary to use force? To find out, Sophie is joined by Andrey Klimov, Russian senator, and member of the foreign affairs committee.